To celebrate the upcoming release of KILLING THYME, the third in the series, on October 4, I'm giving away a signed copy of GUILTY AS CINNAMON, second in the series. Leave a comment below to enter! Cayenne: I was named for Tabasco. No one believes that, but it’s true. My grandparents moved from New Iberia, Louisiana to Seattle in the early 1940s, so my Pops CHECK could work at Boeing during the War. Everybody missed the smell of spice in the air, so when I came along, everybody teased about calling me Cayenne. They were all kind of shocked, or so I hear, when my parents took them seriously. But I like it. And I’ve never met another one. Matt: I’m the oldest of four boys, Matthew, Mark, Luke, and John. Sandra: I changed my last name, Piniella, when I married Mr. Wrong, and the first thing I did after kicking him out was to change it back. I knew Mr. Right was right for me when he said he would never expect me to give up my identity. 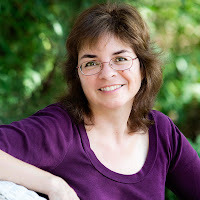 Kristen: My mother adored the Kristin Lavransdatter novels by Sigrid Unsed, published in the 1920s, but popular with hippie chicks in the early 1970s. My dad, who hadn’t read them, misspelled it on my birth certificate. Pepper: Everyone assumes I was named for the shop, but I’ve only owned it a year and a half. My grandfather Reece nicknamed me Pepper after his favorite ball player, Pepper Martin of the St. Louis Cardinals, who apparently had a fiery temper. I don’t, but according to my granddad, I was a little fireplug as a toddler. Only my closest relatives, Kristen, and my ex-husband Tag know my real name. If you want to find out, read KILLING THYME! Leave a comment for a chance to win a signed copy of GUILTY AS CINNAMON, second in the series! The winner will be chosen on Monday, August 29. And if you'd like a dozen bookmarks to share with your bookclub or mystery-loving pals, or more to share at a library, drop me a line with your mailing address at leslie at lesliebudewitz dot com! PS I got my name from my dad, he wanted it, mom wanted Bonnie Jean or Mary Lynn, but, I think Donamae suits me! Mom dropped a n and made it one word. Dad thought of it after I was born! Good story! I just met another Donamae, at the Writers Police Academy, although I think hers has a capital M.
I do like Pepper's nickname and have always thought it would be great to have a cool nickname. However, in x-ray school, I was tagged with "Frog", a nickname I hated. I guess its better to just be myself. The Spice Shop mysteries are great. I love reading them and learning some thing about spices. It was one of the choices that came from a former student of my mom's. Never had a cool nickname though! Thanks! My parents just liked the name. Very popular in a certain era -- inspired by Debbie Reynolds and Debra Kerr, perhaps? With my last name, I sympathize with your parents -- I've always thought a kid should have at least one name that didn't require spelling out or help with pronunciation! I was named for my father and he was named by the doctor's wife! Sounds like a spicy book...and I love her name. Please enter me. My daughter lives in the Seattle area and shops at the market often. She tells me about her shopping adventures there, so reading more about the area is great fun! Glad to help you make the trip with her, on the page! I love cooking with spices and this book sounds so good. No idea, except that my mother liked the name Sally and couldn't be talked into naming me the more formal Sarah and using Sally as a nickname. After years of "Little Sally Saucer" I would have liked Sarah. My sister's name story is more interesting. My mother was eating a piece of Mary Jane candy and there it was, the name for the baby. Oh, funny -- I had to go look up Mary Jane Candy to remind myself what it is! I could get into it. I was supposed to be Sarah Annette - 13th or 14th - but my initials would have been SAP - so my mother insisted it be Karen! Funny! My brother and I are TAB and LAB! I haven't read this series yet, but I'm really looking forward to reading. Pepper is the perfect name for the owner of a spice shop. I love the smell of a spice shop, so I know I will really enjoy the book. Oh, I remember stories about them. Have you read Louise Penny's book with the quints? As a Canadian, she was particularly fascinated, too. This sounds interesting! My mom says I was originally going to be named Angela, but my aunt, her sister-in-law, who was also pregnant at the same time started telling people that was what she was going to name her baby, if it was a girl. So, I was named Brenda instead. Thanks for sharing the background of the characters' names! I love that Pepper's nickname is from a baseball player, not spice. Neat twist! I can't wait to read Guilty as Cinnamon, hopefully by winning it! I know I'd love to read these spice shop cozies. My mom named me after her favorite aunt. My older brother suggested my name, Leslie Ann, after the cutest girl in his 4th grade class! Leslie was still making the transition from a boy's name to a girl's, so there was some occasional confusion when I didn't use the middle name, but other than that, I've always liked it! I was named after the flower girl at my parents' wedding. Thanks for the chance. My parents had agreed that my mom would name the boys and my dad would name the girls. My older sister came first, Katherine Anne. I was born prematurely and my dad was away. When they got him on the phone to tell him about my arrival, he said to name me after my mom. So we were both Martha Elizabeth, she Martha, me Elizabeth. That was fine until the computer age where they want a first name and middle initial and I go by M. Elizabeth. DO NOT name your child with the middle name the one they will go by. And computers convert every Mary Jane and Mary Anne to Mary J. and Mary A., whether they want it or not. Katherine, Elizabeth, and Margaret are probably rivals for the names that generate the most variations and short forms! My parents loved the song "Once in love with Amy" so here I am! I love baking and all types of spices. Thanks for the chance to win. Congratulations on your new release! My mom did not want me to have a name that could be shortened to a nickname. She like the actress Suzanne Pleasette and that is how I got my name. However, my sister calls me Sue and my friends call me Suz or Suzie. So your name gets shortened anyway -- too funny! I love the Seattle setting in this series. Thanks, Annette -- armchair travel, no shoes required! One of my mother's customers had a baby daughter named Diane, and Mom always said she was the most beautiful baby she ever saw. :) Just looking at your book covers makes me smile! Thank you for a lovely post and the chance to win your book. The most beautiful baby, until YOU came along! Thanks for the story, and the kind words -- how could you not smile at that dog?! I was named Rebecca after Rebekah from the Bible! I like Pepper's nic name! Your book sounds very interesting! And I see that old spelling is making a bit of a come-back! Thanks for joining in the fun. She dreamed your name! Love that -- would anyone believe that if I put it in a book? =) Lol, well... Books are where I go to believe in the unbelievable and completely open my imagination. That can be such a lovely legacy. Another dual-gender name! It does seem to have become mainly female, but we do know a 50ish man called Jamie. Thanks, Nicole! I love that cabinet, too -- I sent my editor photos of several Chinese apothecaries for the artist, and he did the rest. The story -- and I've forgotten which book it's in, maybe Cinnamon -- is that Pepper admired the cabinet at the home of a neighbor when she was married, and when he died, his family gave it to her. You can imagine Tag's reaction! The red light is the lamp that called to Pepper in the import shop on the Market's lower level in the confrontation scene in ASSAULT & PEPPER, and that flickered so wonderfully in GUILTY AS CINNAMON! And Arf, well, he's such a wonder! My grandfathers name was James and my uncles names is james Jr! Thank youy for the awesome giveaway! love this series! Takes me back to Seattle, where I left my heart long ago! Names are very important. They need to suit the person. They do -- which is one advantage we have in fiction that we don't have in naming in real life! My mom was in the elevator at the hospital and heard a mom calling her daughter Renee. A lovely name, and a lucky elevator ride! My real name is Francesca, named after my grandmother, but when I was brought home from the hospital, my two older brothers (they were about 2 1/2 and 1 year old) couldn't say Francesca so they said "The babes crying, or the babes hungry" And I have been called Babe all 73 years of my life. I even sign my checks with that name. Like Babe Ruth and Babe Didrickson! The protagonist in my Food Lovers' Village Mysteries is the daughter of a woman named Francesca, nicknamed Fresca, and we have a friend here with that name as well. Beautiful, but definitely a mouthful! 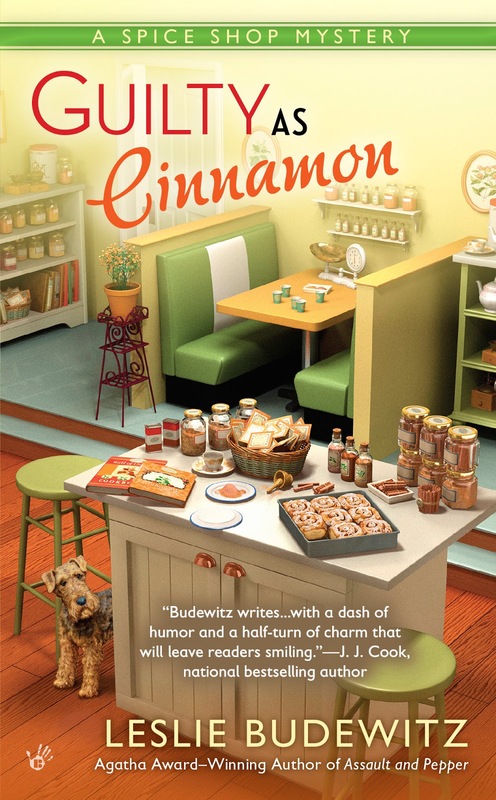 This weekend's giveaway is for GUILTY AS CINNAMON -- tune in next month for KILLING THYME! Another fun story -- Patrick and Patricia and their variants are names that appear in so many European cultures. I was just about to say I hadn't used either of them yet, but there is a very minor character in a future book whose last name is Patrick! I know exactly how I got my name. I was born in 1964 when they put women to sleep to give birth. My mom had the name Yolanda picked out for me, but I don't know the middle name. While my mom was still recovering and not yet fully awake, my dad filled out the birth certificate. He gave me my mother's first name, Ellie, and his mother's first name, Sue. That's the only instance of my dad being sneaky that I ever heard about. That's cute! We have a friend named Ellie, but it's short for Eliana! And, it's trendy these days! I was born two days before Christmas. My father wanted to name me Merry (that is what most people call me), but my mother said, what if she is a colicy baby and not so Merry? What is she goes into professional life and Merry sounds so nickname and not formal. Let's name her Meredith and we can call her Merry. So that is how I got my name. Oh, I like that! A good friend was born on Dec 22 and is named Christy -- not for Christmas, but for her mother, Christine, who was born on Christmas! LOVE the back story on their names! My father says I was named after my Uncle Kelly but my mother says it was his ex-girlfriend, lol! Funny -- love these parental tug-of-war stories emerging! We went to Pikes Place Market years ago with friends that lived in Seattle. We loved it! My dads nickname for me was Katy Did. Nicknames are fun. I hope you enjoy the return trip with me, on the page, Katy Did! Have no idea where my name came from. My oldest brother was named Charles after some ancesters. My youngest brother has my dad's middle name.The rest of us five, I've no idea. It's something we never talked about. I like the names of those for this series. There are a few stories how I got my name. One is that my sister got to name me and it was after a boy on the Mickey Mouse show. Never have checked to see if there was a boy named that. My middle name is Angela and the story is they were going to call me Angel but I was screaming so badly they changed it. I hated it when I was in grade school though as I guess it was a popular name but backwards for girls my age. So the teachers all thought my name was Angela Kay and boy would I get sassy and tell them the way it was. That was the only thing I would be that way about since I was so shy and wonderful in grade school. Seriously I didnt turn into a loud mouth that cant be kept quiet until after 5th grade, lol. Oh and I have already read this wonderful book and have my copy of Killing Thyme preordered so I do not want to be entered for the copy. I just had to stop by though. I love this series!! Thanks for a fun story, Kay! I got my name from my daddy and my mama. The Donna comes from Donald and mother's middle name was Eileen. When our daughter came along we used my great-grandmother's middle name for her first name, and then used Eileen as the middle name. And when her daughter came around we once again used Eileen as the middle name. Those traditions can be so important, can't they? Thanks for sharing the story! Marvelous theme...I loved Assault and Pepper and even went to the store to explore spices in general. Book 2 opportunity is great. Lucky escape! I've known two women named Avis, one 100 yrs old, and one about 30 -- the name is a rare bird these days! According to my mother, I was named after a friend of hers, Linda Jean. My name is Linda Joy. Pepper and Sandra would agree that one of the privileges of being an adult is choosing what to be called! The contest is over and I'm waiting to hear back from the winner before announcing her name here. Thanks to all of you for sharing your fun stories -- you never know when you tell a writer a story what she might use years later! If you've read a Spice Shop Mystery, you know that identity is a key motif and even a plot point throughout the series, making names particularly important. The theme continues in KILLING THYME, and I hope you'll all want to see how it plays out! And the winner is ... Marci Konecny! Congratulations, Marci -- and thanks again to all of you for joining in the fun! Thank you so much. I'll be waiting by the mailbox in excited anticipation!!! I received your book yesterday! Thank you so much, you are very kind. Looking forward to my evening glass of wine and a good book. I can't wait to try out some of the new recipes!! =) Thank you, thank you.